The November Ranking Battle results are in! We had a great showing with 87 attendees. The Ranking results from Ultra Street Fighter 4, Dead or Alive 5 Ultimate, and Virtua Fighter 5 Final Showdown are added below. We also have a link back to the ongoing Smash Bros results. The ongoing Results Tally board has been updated below. The scene is set for a few possible upsets at the top of these lists at the Final Ranbat on December 14! The Monthly Ranking Battles have been a great fixture this year, running consistently since their return in April and averaging 74 attendees each month. 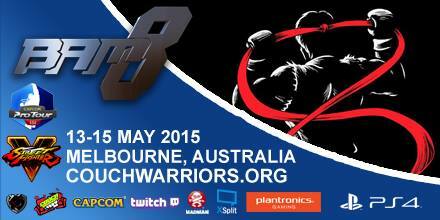 Announcement – As an Incorporated Not-For-Profit Organisation, CouchWarriors holds an open Annual General Meeting. All are welcome to attend and contribute to the community. It’s a great chance to participate and if you would like to join the CouchWarriors committee so you can be updated with opportunities to volunteer and have your say, please come along. November events – Ranking Battle Nov 16th! While we’re having a blast at PAX Australia 2014, here is a quick reminder of our next Ranking Battle event, a day of tournaments and casuals, will be on November 16th – details at the link.